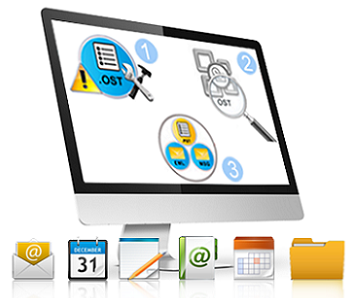 Recover data from OST file competently and steadily with Exchange OST Recovery Tool and convert the file into an identical PST file. Formed PST file can safely be export to MS Outlook for offline access. Dual scanning mode to regulate the level of corruption. Recovers only the selected items from the corrupt file. An advanced email featuring option can be enabled. Simply recover and upload ost file into Office 365 account. Divide large PST file into parts of GB/MB. Remove OpenPGP and S/MIME encryption of OST Mails. Use OST file recovery software, without MS Outlook. A structured view of the emails, attachments etc after extraction. Due to the incautious nature of human being, the user deletes data from the OST file without the knowledge of the outcomes. The recklessness affects the OST file and corrupts it. And when the situation like this happens, the only thing the user wants is the recovery of emails and to be continued with it. But as the internal structure of the OST file breaks, the file becomes obsolete to go on with it. And to recover the data from the corrupt file, our Exchange OST Recovery software is the essential one that you can truly trust. The unique algorithm and minimalistic design developed the software as a keeper of corrupt OST files. Whatever the situation is, if you have a corrupt file and wants to convert or recover data from it, simply allow the Outlook OST recovery software to take care all the hard works and save valuable time for you. The Outlook OST Recovery can be use to easily convert to PST, MSG, HTML, EML etc for the portability to other desktop email clients like Thunderbird, Live Mail etc. Software easily finds out and recover the emails that you have deleted unintentionally. The software will produce a view from the item count of all the recovered components like calendars, tasks, contacts etc and show it to you for safe keeping. The noticeable advanced feature of OST file recovery tool is that it will allow you to save the status of a scanned OST file and later you can load the scanned file and continue with it. After the complete recovery, the software will generate an Export report with all the details of the mailboxes and path of the saved files. You can save the report in the .csv format. Different naming convention for the file format .msg and .eml can be set to extract the file into other clients. You can download the OST Recovery software and install it on your machine freely as a demo version. Although the demo version is functional, but there are certain restrictions as you won’t be able to recover more than 25 items/folder. There are also some advanced features that can only be unlocked when you purchase the full version. It is recommended that you use the demo version before the full version to get familiar with the OST Recovery Software.